Great recipe, I have baked it many times ! I made this cheesecake and it turned out so nice that I can't imagine that I baked such a wonderful cake myself! I let it stay in the water bath for an additional 30 minutes as it was too hot to remove from the oven, thus the bottom was all soggy and wet. Must I remove the cheesecake from the water bath immediately after baking it? It tastes very nice and soft. My kin love it very much. Thank you for posting this recipe! Yummy!! You've got to try this. Excellent. Soft and fluffy. I love it very much, so do my friends. It is great texture. One of the my best. Thanks. I'm just a begginer and I got it right. My whole family love it very much!! Can I replace chocolate powder 20gram instead of baking flour 60 decrease to 40gram? The cake's good. But somehow mine isn't really soft and fluffy like it's supposed to be. It's kind of dense actually? help! I had just tried a japanese style cheesecake in an asian bakery and so decided to make my own for my birthday following this recipe....it was just as delicious as the one from the store. Best cheesecake I've had! I made this cake 3 times already. The first time, it didn't rise at all. The second time, I tried the green tea version. It rised, but somehow it was too sweet. The 3rd time, I tried to stick to this recipe verbatim. But this time, only the top half of the cake rised. It was disappointing. I wish I know what is wrong. Thanks for all the reviews. I tried baking it today...my first time, excellent, nice and delicious. Really soft and fluffy. Cant wait to try other recipes...and thanks for the clear instructions too...Million thanks Diana for your prompt reply. You are great! A good cheese cake. A slice is not enough for me. I love it. A lot of work but it's worth it. This is the first time I make this recipe and it turns out pretty good. It tastes so good, fluffy and light! Thought the top of cheesecake gets cracks and brown very quickly, I manage to prevent burn by turning down to 320F at 40 mins. I wanna know how to prevent cracking on top which I already use a water bath for baking. This is the best Souffle Cheesecake. Thanks Irene for this wonderful recipe. I'll probably try it with macha or chocolate the next round. Thank you for sharing this wonderful recipe. This is my favourite at the Chinese bakery and I've been searching for the right recipe for a long long time. It came out EXACTLY like the bakery - soft, light..like sponge cake. This is a great recipe. Some important points about the chemistry for those not getting great results. Cake flour - find it, use it. It's lower in protein yielding lighter, fluffier goodness. Putting AP flour through a screen doesn't make it super-fine - you're not going to cut protein molecules with that. Super Target carries cake flour, so it's not THAT hard to find. Make sure to whip the eggs to soft peaks - you're basically making a foam, or in this case, almost a meringue. Don't stop at "paste-like" white goo. It might be best to slightly change the process listed. Whip eggs by themselves to nearly soft peak, then add cream of tartar to soft peak, then ->slowly<- add sugar. Also - look for "superfine" sugar ("caster" in Britain). Regular granulated won't work as well. I was wondering how you guys measured out your ingredients esp. the dry ones like the flour, sugar & cornflour using US standard cup measurements for baking. Thanks for sharing this recipe! I made this cheesecake yesterday and I absolutely loved it! However, despite wrapping the cake tin in 4 layers of foil, a bit of water still managed to seep in and so the base of the cake got a bit wet. Fortunately, some kitchen paper helped to absorb the excess moisture. The texture of this cheesecake is nice and spongey - almost like a sponge cake - and it imparted a delicate cheese flavour. As a bonus, it's the best-looking cheesecake I've ever made. I will definitely be making this cheesecake again. By the way, is the top of the cheesecake meant to firm up when it has cooled down? coz that's what happened to mine, despite it being desirably softer when still warm. This is a very good recipe, the cake is very soft and delicious. Thanks for the recipe!!! When I lived in Japan, there was this cake in a little wrapper with a penguin on it...it was mine and my siblings favorite! I didn't know this cake was going to end up being the exact same thing to my surprise, it was...and it was sooooo yummy!! Thank you for this recipe...I made one yesterday for my daughters birthday, and i'm making one today for the heck of it! I've tried making this cheesecake two times and I just can't seem to make it right...I can't get it soft at all. Mine was thick like a new york cheesecake. What did I do wrong?? This is a great recipe! I use AP, sifted it twice and it still turned out great! Substituted lemon juice with orange juice. The next time, I would add is some orange zest and sugar. Thank you very much for the superb recipe! I like the cake, but not sure it is as light as it should be. I baked it in a regular heavy duty aluminum 8" cake pan lined with parchment and baked it in a water bath. I find the texture to be between cheesecake and sponge cake. The flavor is a little bland. It was simply delicious. My family loves it. I'm not a big fan of cheesecake, but this is awesome. It was an easy recipe, and tastes good. My family loves it. Thank you for sharing your recipe. THANK YOU FOR SHARING THIS RECEIPE. ITS VERY VERY NICE. i'm guessing that the cake got burnt because you didn't use a water bath, which is something like a pan larger than the springform tin with the batter in it, filled to 2-3inches of hot water. put this together into the oven to bake and this will allow the cheesecake to bake without browning excessively on the top. and oh, remember to line the springform tin with aluminum foil always to prevent water from the waterbath from seeping in. Soft, fluffy and not too sweet, this is excellent!! I've made it a few times and even my American friends couldn't get enough of it. I'm a begginner and I got it right, first attempt. Except the top a bit burnt, temp 180 degree too hot??? or water bath too shallow, I can't find a deep pan. OMG. I love this cheesecake so much.Thank you for sharing your recipe. i want to ask, i don't have cream of tartar here. what is the best one to have like that? thanks.. The Best Cheesecake ever!!! I tried for the 1st time and got it right! Highly recommended for all! This is my first time baking cheesecake, it turned out to be a huge one. I baked it for more than 1 1/2 hours, but I find it to be too moist or wet. Should we leave the cake in the oven for another 1 hour with the oven door ajar after the cake is done? Hi Diana, it would really help me if you could convert ounces/grams into cups and spoons of the Japanese Cotton Soft Cheesecake recipe. I did convert by the help of your conversion calculator, but it wasn't giving me a accurate proportion, thanks runa. Perfect & excellent.Thanks. Do you have a melt-in -the mouth butter cake recipe to share? Excellent cake, just tried it yesterday. Easy to make, simple and delicious. The cheesecake is so soft and fluffy. My kids and I like it very much! Although I'm not an experienced baker, I got the right texture I wanted for the first attempt. It's so easy. It looks and tastes just as good! Excellent! A very easy cake to make. Tastes just like cheesecake, light, creamy and i could taste the cheese unlike chiffon cheesecake. Best eaten chilled. Excellent!Very soft,light and delicios. I did not bake in a water bath, just the usual way. How to prevent cake from sinking, it sank by almost 2 cm? This is the first time I've tried baking a cake. And I am really pleased with the results I have! My boyfriend loves it. Irene, thanks for the clear instructions. I baked the cheesecake last night and it tastes good, but the texture is dense, is it because i didn't whisk the egg whites long enough? Is corn flour the same as cornstarch? Yes, cornflour is the same as cornstarch. Excellent! Thanks for sharing the recipe. *FYI: Please pay attention when you whisk the egg whites, Just take the foam only, do not take the liquid on the bottom of the egg white mixture, because that's the main reason your cake won't rise. Hope this info help y'all. I'm just a beginner and the cake came out really great! really smooth and soft. but i felt that the cheese taste was a little lacking. Thanks for sharing this wonderful recipe on the web! I have tried a few other cake recipes taken from other sources but results were mostly disappointing. I followed your recipe exactly and the cheesecake turned out soft and yummy with a perfect golden brown top. BTW, the cake shrunk a little from the sides - is this natural? My husband couldn't resist the cake after taking the first bite. Thank you so much. I baked this cake for a friend's birthday and those who ate it really LOVED it. However, the cheese didn't fully melt. Will bake it for Chinese New Year next year, and I'll make sure that the cheese melts before I bake it. Wonderful cake!!! Any suggestions on storage for use within 3 days? Thank you. Looking forward to making many more desserts from your site..
this was a wonderful recipe. thank you very much! very unique, light and fluffy. Hi, I have read all your reviews and am glad that they have had successful results. However, I wonder if you have tried steaming the cheesecake instead of baking it? Do you know the difference between Cake flour and Hong Kong flour? Will Hong Kong flour result in an even softer texture? Would definitely appreciate your expert input on the above questions. Thanks. Thanks for this wonderful recipe. I baked it this morning and it was really wonderful. First time I have ever made this cake, it is absolutely terrific. Did not have cake flour, sustituted rice flour. Great cake for celiacs. hi! i'm from malaysia. this wonderful cake is so easy to made. my whole family loves it. I had been searching for this type of recipe for the longest time! I was not disappointed with the taste. It was spectacular! I do have one question. I doubled the recipe and put it in a rectangular cake pan. The result was a "soft as cotton" top but the bottom was a dense, cheesecake. Is it supposed to "separate" like that? I tried a similar recipe and found the cake to be heavy at the bottom. Overall it was still good. You didnt mention when or where to add salt, to the flour or egg white mixture. Love your blogg spot. Learned a great deal. Thanks. Excellent cake. Really nice and soft. Some commented that it wasn't cheesy enough. But it was GREAT!! one question though, what happened to the salt? Only my first attempt was successful. My subsequent attempts (3 so far) all failed! So disappointing. The cake didn't rise well and the bottom is often hardened. Is it necessary to mix the flour well into the cheese mixture? I have been doing that but the result was a batter filled with bubbles. Was it due to over-mixing? What went wrong? Does the depth of water used in the water bath affect the outcome? Thanks! I did not even know the existance of Japanese cheesecake until I read it from a blog while looking for Malaysian recipes. So I searched online for the recipe and so glad I found this easy-to-follow recipe. And I made it today and it was a success!! The cake came out very soft, moist and light though initially I thought I messed it up because the cake sinked as its cooling off. So I guess it is OK if the cake sinks. I forgot to get the lemon from the grocery so I replaced it with 1/2 tbsp of orange flavor oil and 1/4 vanilla for extra flavor. And the flavor of the cake turned out great with orangy flavor instead of lemony. This was a wonderful sponge egg cake, Asian style. It is not really sweet, and not really a cheesecake but it is so terrific. I topped it with homemade apricot jam (thin layer) and whipped cream (thin layer) for presentation and to add a little kick. I turned the oven down to 320 at 40 minutes and didn't have a problem with cracking. I also used a springform pan and wrapped it 3x in tin foil, no leaking happened. Thanks for the recipe! It's ok. I wouldn't bake it again. Thank you for sharing this wonderful recipe. I am a beginner at baking. Like other reviewers I tried converting the measurement into US standard (cup and spoon) using the conversion you provided. However, I don't think I got them correct. Would it be possible for you to provide one with US standard measurement for me? I followed the instruction exactly but my cake was not cotton soft. The thin top layer was cotton soft but the bottom was dense. Could you tell me what I did wrong? Also, when should add the salt? I hope you can give me some advise. Oh, even though the cake was dense but the taste was perfect, light and not very sweet. I really want to make this cake again. Thank you. It is a wonderful cake. This is the best japanese cheesecake recipe that i've found so far! i've tried many others, but the cake ended up being too wet. it's possible because this one requires more eggs than the others. Even though a little water went into the springform pan while baking(maybe i didn't have the aluminum foil wrap the pan high enough), the cake didn't seem to be affected by it. we didn't have whole milk or 2%, only soymilk and nonfat milk. i chose soymilk becasuse it has more fat. but the cake still tastes wonderful. by the way, the cake tastes even better after it's refrigerated... tastes like sara lee's butter pound cakes except with cream cheese flavor. i baked it today and it turned out great, but i have a question. is it really going to form a cottony soft bread without the texture of the usual cheesecake? Thanks Irene for the recipe. I tried it once and everyone liked it. I'm baking it again today and wonder if I can freeze them in time for Chinese New Year. Thanks! What an incredible recipe! Delightfully soft and delicately rich. My friend and I ate up half of it in one go! I am a total beginner at baking and this is the second time baking this - the first time, it was totally dense. I don't think I understood the term 'soft peaks'. I did the whites first while waiting for the cream cheese and butter to melt - and not even completely! - so that did not help either. The second time, after reading through all the reviews here and on other forums, I figured out how to get a meringue/souffle. I did the rest of the stuff before the whites. But this time, I underestimated the volume (since the first time there was so little of it) and used an aluminum pan from the shops that was too small so as it rose, it spilled over. I think I did everything else correctly - the batter looked good and the whites kept their shape so well - so I'm a bit cross at myself for not expecting the larger volume and the rise. I had to take it out halfway and pour out some of the water bath. I'm not sure how it will affect the texture inside. But it looks more like what it should than the first time around. I will do this another time and I think I'll have all the techniques needed to do this cake well. thanks for the recipe. Yes, yummy and pretty easy to whip up! Super Yummy Yummy! My family members all liked it. I wanted to make this a very long time ago but never had the right recipes. Thanks Irene. This cheesecake turned out just like the description "cotton soft". We enjoyed it! Thank you! For the 2 oz cake flour, I used 1/8th cup. For the 1 oz cornstarch, I used half of the 1/8th cup. I sifted this into the yolk mixture. The recipe does not say when to add the salt, but I added it in step 1. For step 3, I used about 1 1/2 cups of the beaten egg whites and gently folded it into the yolk mixture to lighten it. Then gently fold small amounts of this yolk mixture a little at a time into the egg whites without deflating it. I used a 9 in. non-stick cheesecake or springform pan lined with baking parchment paper on the bottom. I used foil on the outside of the pan, placed this into a larger glass pan, and added about 2 in deep of water for the water bath. Although the cake rose high, it did not spill over. At the end of 1 hr 20 min, I turned off the oven and did not remove the cheesecake immediately until the oven cooled. It shrank back, but it now has a cotton-soft spongy appearance inside with a beautifully brown top. Melts in your mouth - perfect for babies to eat! It is a deliciously delicate cream cheese spongecake! I've made this recipe about 5 times now and I love it. But each time I make it, the surface of the cake cracks when it's cooled, unlike yours... any idea why this is? Do all of you realize that salt is in the recipe but it's not even in the mixing procedure? Salt could be Optional!! The cheesecake cracks on the top after it's baked because either you have cooled off too quickly (temperature drop) or over-mixing the batter. Egg whites should be close to double volume (soft peak). Make sure the mixing bowl is clean so it would help your cheesecake to rise and check your ingredients "HAS YOUR CAKE FLOUR EXPIRED?" Also your cheesecake will not rise because ONCE YOUR CHEESECAKE IS IN THE OVEN ", all of us tend to open the oven door to check on the cheesecake and slam close the oven door which will make the cheesecake will collapse". My first time made it, and it turned out perfectly. I would prefer a little more cheesy taste. Anyone know how much more cream cheese I can add to make the flavor a bit more cheesy? Thank you!! Thanks for posting this recipe. This one is a good recipe that is a combination between spongecake and cheesecake. Not too heavy or too light. It's just perfect. Thanks! Hi all, I have not tried this out yet. Can anyone explain to me what does "water bath" mean? Thanks. Thanks for the recipe. We all love this cake very much. Yummy Yummy. Great recipe! I baked this cake for a friend's birthday and everyone loves it. The cake turns out to be really soft and fluffy. Thank you so much for the recipe. Thanks for the recipe, I've just baked my first one. The top is brown and cracked, even though I have a water bath and there's still water in the pan. The only thing I can think of is that I uused a smaller cake tin and I have a fan forced oven. Also during the last step of mixing I can see that there's a lot of BIG air bubbles. Is that suppose to be there? The cake tasted great. However, I could not find cream of tartar and I had to use normal cream instead. And when I mixed the cream with the egg whites with the mixer, it turned watery and did not achieve the soft peak stage. Hence, I had to re-do this step and this time round, I did it with the cream. And the cake, still turned out ok. But I struggled a bit getting the right time to ensure the bottom of the cake was well-done. Woud appreciate if you could advise me. Anyway, thanks for the recipe. As a beginner, I have to say, this cheesecake made me look like an an expert! Fluffy, and so heavenly soft. I also noticed that the bottom was wet so I popped back the round pan itself sans the water bath and covered the top with aluminum foil and it came out superb! Thanks so much for this recipe, this is the type that will be treasured by my family for generations. I really enjoy all the recipes from Diana's Desserts website. It helps me make and bake things easy with an excellent outcome and most importantly, things taste really awesome. This is the only recipe website that I can trust. Thank you Diana. Two thumbs up!!!! Can anyone tell me how to mix in the flour to the batter without it getting lumpy? I spend the longest time trying to flatten lumps against the sides of the bowl! I baked it but not tasted it yet. Awesome! This is my first try and it turned out perfect. The ingredients were easily available and the method is in good layman terms! Am really thankful for this recipe, the cake is for my bf's birthday, he and his family love it to bits. Love ya! I believe I have found the recipe I've been looking for for a long time. I came from Taiwan; I used to buy this kind of cheesecake from the bakery all the time. After I moved to the US and tried American cheesecakes, I miss the light & fluffy texture of Japanese cheesecakes very much. 1) Many reviewers reported that water got into the cheesecake when using a spring form baking pan. Do you recommend using a regular 9" round baking pan with lining? 2) I also have problems converting the measurements. For example, I converted 60g/2oz.cake flour into 5/8 cup and 20g/1oz. corn flour to 1/4 cup. Fortunately, I read the review from 'Lisa the Baker', her conversion is 1/8 cup and 1/16 cup. It would be a disaster if I used my conversion. Would you please convert all measurements into cups and tablespoons? Your help is highly appreciated. Thank you. It's very tasty, my family liked it a lot. This cake recipe is the closest you will find to the store bought Japanese Cheesecake. The texture of this cake is perfect, very fine crumb, yet still light. I prefer this lighter tasting cheesecake than the traditional heavier American cheesecakes. I am told that cake flour can be purchased at Safeway stores in Australian and cake flour is available at Coles supermarkets under the Anchor brand. I'm also told there is an American store in Melbourne that sells Swan's Cake Flour which is an American brand. They may carry it online at this store. This is such a wonderful, simple no-fail recipe. The cake always turn out so soft and absolutely delicious, can't say how happy I am for stumbling upon this recipe. Thank you so much! Excellent! I got it right the 1st time, soft and yummy. Would prefer it to be more cheesy, can I add more cream cheese? I tried this recipe for the first time this weekend and it turned out very good. I have never baked this before, so I was very pleased on how it turned out. I will definitely make it again, but this time add the apricot glaze on the top to make it more pretty. Thanks! I converted everything from this site (http://www.jsward.com/cooking/conversion.shtml)..my cake was amazing. Thanks for the recipe. I WANT TO KNOW HOW I CAN MAKE THIS IN A MICROWAVE? PLEASE HELP! Thank you very much for sharing this wonderful recipe. It's really soft and spongy. I baked it twice in one week because its so yummy. This is the most successful recipe I ever found in the website. Once again I wish to thank you for your "AMAZING" recipes. 1) Cake flour is NOT the same as all purpose. A light substitution is to take a cup of all purpose, take out 2 tablespoons, then add 2 tablespoons of corn starch. It's not great but it works alright. 2) To get rid of clumps, make sure the flour is well sifted and add in parts. 3) I would never use a spring form for this recipe. My 9 inch square pyrex works very well in a 9 by 13" brownie pan waterbath. 4) For even brownie in a non-convection oven after about 40 minutes (NO SOONER OF YOUR CAKE MAY FALL), turn the cake. This recipe is definitely a keeper! I took note of other reviewers' comments and the cake came out perfect!! i have tried your recipe and the cake turned out well, however, the cake sinks after cooling down. Please advise what could have gone wrong, Thanks! very good ... finally found this recipe. delicious. i've added lemon rind, and the flavor is further enhanced. my only frustration is when i take it out from the oven, it will sink and gives a wrinkled top. how to avoid this situation ... HELP! tried twice and was the same. unlike those sold in the shops, and the top looks nice and smooth. Question, should i use large eggs instead of medium sized eggs? The search for the perfect fluffiness - but what happens when you have found it? This is an easy cake to make ...really yummy and delicious. Soft, moist, melts-in-the-mouth. Everyone who has tasted it had only good remarks. Highly recommended ! This is my fourth time trying this recipe and the cheesecake comes out really dense every time! I am trying to figure out what I did wrong. I didn't add in the salt, is that okay? Also, I have used both cold and hot water for the water bath and the results are similar. Should I cover the pan with foil before putting it in the oven? Am I over mixing? Help please!!! HI DIANA, MANY THANKS FOR THE GREAT RECIPE. I BAKED TWICE ON FRIDAY AND 2 PORTIONS AT ONE GO ON SAT. IN A 10 inch square tin. THE RESULTS IS THAT EVERYONE LOVES IT. BUT I STILL DID NOT MANAGE TO GET THE REALLY COTTONY FLUFFY TEXTURE THAT IS SHOWN IN YOUR PICTURE. GOING THROUGH ALL EARLIER PREVIEWS, I REALIZED SOME OF US ALSO GEL THIS PROBLEM. ALSO, AFTER MIXING IN THE CREAM MIXTURE TO THE SOFT PEAKED WHITES, I GET LOTS OF AIR BUBBLES. MAY I KNOW WHY THIS HAPPENED? THANKS. HOPE TO HEAR FROM YOU SOON. The first time I made this cake it shrunk considerably. Second time around, it did not deflate as much. But I still have not gotten it to be cottony/dry as the picture shown…but mine is soft but too moist I think and I can hear the bubbles as I eat the cake…maybe has something to do with the flour measurements. I’ve bought Japanese cheesecake before, and it’s supposed to be soft/light that u can rip it into pieces like a spongecake, but much more moist than a spongecake. Cake was absolutely amazing! I used 1/2 tsp. of lemon juice instead of cream of tartar, and I beat the egg white until peaks were formed. Also I think the most important of all is that the cheesecake must be baked in a water bath! This was a wonderful cake and lives up to the name. I will be making this again. Thank you. Julia: I'm sorry to say that cream of tartar is not a cream. It's a stabilizer in form of a powder - if you add anything liquid to egg whites during whipping, of course they wouldn't form a nice fluffy meringue. Next time, try checking your ingredients. This recipe was wonderful! Rose perfectly, didn't crack. Tip: Leave it in the water bath after you take it out of the oven. This will keep the cooling process relatively slow, thus preventing those ugly cracks. I used a little bit less sugar, came out just as well. I didn't add the salt, didn't open the oven except for at the last ten minutes to check for doneness, and my cake did not sink. I tried baking this recipe today. Turned out quite satisfying yet not as fluffy as expected. The taste was good and all except for its New York cheesecake-like texture that annoys me. I wonder why.. anybody got the answer? Thank you for sharing this recipe, and to Lisa the baker as well. Your tips helped me to bake this cake successfully. Now I know my first failure's cause. It had risen perfectly this time! I just tasted this. It is so very mild with such a perfect taste. I also turned down the heat after 45 minutes..to about 315 degrees and turned off the oven for the last 12 minutes of or agebaking but left it in the oven until the very end of the hour and 10 minutes. When the cooking time was up, I opened the oven door slightly while it cooled down still still inside. No cracking and the top was golden! I will definitely bake this again. I can't wait to have others taste it. I have been looking for such a recipe from my childhood (a downtown bakery used to make something very similar). I never knew the Japanese were users of cheese products... nice surprise for us all.. thanks for the luscious recipe. This recipe is awesome!!!! It's not too sweet nor too thick like the original cheesecakes or new york cheese cake. Thanks so much for sharing this recipe!!! Finally made this and it is wonderful, just the texture I've been looking for all these many years. Thank you for translating into oz. as I was intimidated by other recipes with grams. One thing, I think it could use more flavoring, 1 TBSP. lemon juice didn't seem enough, maybe adding grated lemon rind? Anyway it's a great cake. Made this cake several times, it rose very nicely in the oven but the cake 'collapsed' after I took it out of the oven. How can I prevent this from happening? Taste and texture is great. Thanks. When should the salt be added in? Hey there! Excellent cake but you mentioned in the ingredients that 1/4 tsp. of salt is required, but when and where does the salt part come in? it's not fair. I cannot make it can you guys please help me. Thank you. The cake tastes nice! However, the cakes texture didn't turn out right... The cake was separated into two layers.. The top is light and fluffy but the bottom is firm (like a layer of steam egg pudding). What did I do wrong? What is cake flour? Is this the same as self raising flour Or Sponge mixture? It turned out wonderful. I used lime instead of cream of tartar, loved it! Will try again! I lost count of how many times I baked cotton cheesecake and it just failed to set properly. The middle is still wet, the texture is not cottony, the top burnt, the cake sinks and so on. When I came across this recipe, I thought I will give it a final try because it has so many positive reviews. The texture is so soft, so cottony, no lies. The center actually sets. The top is a beautiful golden brown. It tastes splendid! My brother who doesn't like cakes (at all), had seconds. He also said, "bake another one just like this tomorrow". Its just like those sold in the bakeries, maybe even better! I will NEVER venture for another cotton cheesecake recipe. Thank you so much!! Tried to bake according to the recipe and some suggestions from the above comments. The cake looks ok....it doesn't collapse or crack and water does not leak into the baking pan but why is the top layer light and fluffy but the bottom is soggy? Can you please advise me on what went wrong or how I can make the cake as light and fluffy as shown in your picture? Thanks. I finally got it on my second attempt...the soft cottony feel of the cake. This recipe is completely fantastic..I baked it in a 7 inch round tin pan and I halved the ingredients, the cake rose but the tin was too small so it cracked. Next time I will use a bigger pan. Just the cheesecake that I love. I made it into a strawberry shortcake. Hi..I'm planning to bake this cake for my anniversary. Can I halve the ingredients and bake this in a 7 inch round tin pan? Will it still rise? We're just baking the cake for 2..serving says 12..its a bit much..
i like this cake, i bake many times but never get it right. the bottom was soggy and look like the cheese not melt. i'm using portable oven that the heat from the top. I like baking very much, but here in Germany we lack to have some ingredients like corn syrup and cream of tartar. Can I use anything else than cream of tartar?, please answer me, and thanks for sharing. tried many times and everytime turns out perfect! The right amount of sweetness and fluff! I so want to make this ! !e but unfortunately I don't have a weighing scale yet and I cant wait to get one to make this !!! so could you please give me the cup measurements for the sugar, flour, and cornstarch!! Excellent taste. So YUMMYLICIOUS. Thank you so much. It turned out so well, just like those sold in the cake shop. Fabulous, thank you for sharing your recipe Diana. Really good cheesecake, and I had no problem with it rising, but it cracked big time. Any idea why that happened? I did bake it in a water bath as instructed. Thanks a lot! This is the best cake ever! And so easy to make! For those who can't find cream of tartar you can use baking powder. This is a great cake though it takes longer to make. Its soft and yummy. If you'd like the top to be a little browner just stick it in the oven with out the water after its cooked and the top will be a pretty golden brown. Hope you can enjoy! This recipe is so good!! I had made this twice and both times earned heap of praises from friends and family.. Two thumbs up!!!! Love it! Thanks a lot for the recipe. The taste was great but it didn't turn out as soft and fluffy as I had expected it to be. I guess it was because I had over-mixed the batter so it gluten-like..
Omg! Just the recipe I was looking for. Thank you so much! It turned out perfectly! I tried this recipe yesterday the first time and it was GREAT!!! The cheesecake was so soft en fluffy and it had risen so sooo high!!! Everyone loved this cheesecake! I made it the first time and I did not put my pan IN the water bath. Instead I put a pan of water BESIDE it. Also, I think it should go other way around. Fold the egg white into the cheese mix to separate the liquid. I didn't expect that I could make it right the first try...I baked it accordingly and it was a GREAT experience! Another recipe learned from your site..Thanks Diana for sharing your recipes - more power! I bake a lot of cheesecakes, so this recipe intrigued me. It came out looking just like the picture but I couldn't decide if I REALLY liked it enough to make again. After a day or so in the fridge, I LOVE it! It seems to get better after a day or two - try it! It turned out better than I imagined! Really nice, moist and delicious! My only question is: When was I supposed to add the salt? Thank you for sharing. I have been looking for this kind of recipe for years after I had it in Hokkaido, Japan. It turns out very very tasty. Everybody loved it...... Wendy, from Colorado, United States. It was very good and very soft. I loved it! Hi, I'm only 13 years old and I love this recipe very much! My family loves it. I made it twice and I'm gonna make it again. I tried this recipe twice. The top of the cake turned out fantastic! But the bottom half is rather custardy in texture. What could the problem be? Finally...I tried your recipe. IT'S PERFECT!!! Fantastic recipe and so simple! I love to eat this while it's just out of the oven anf still warm, perfect so moist and fluffy. Thank you for the recipe. I never did dare to try the Japanese Cheesecake as it seems very hard. The recipe works perfectly and taste really good too! I've baked two of it now just over the weekend. Definately a recipe to keep! What is a water bath? Heat 160 degrees C for how many minutes? Thank you. Thanks for sharing this recipe. It's easy to follow and my cake turns out really soft and fluffy. I'm a novice to baking (and cooking) but this is really easy! I reduced sugar to 115g though. Its soft and fluffy. I will definitely bake again using this recipe. Delicious!! Yummy Yummy Yummy!!! Very Good!!! Thanks Diana. When or where do you add the salt to? Great recipe! Do you think I can convert this to a chocolate cheesecake by adding cocoa powder? How much do you think will be just right? I thought you might like to know that I made this for my daughter-in-law's birthday. She LOVED it! And deemed it as good as any cheesecake from Japan. How would she know... she's Japanese, and moved to America after she married my son, when she was 27. She's had a a lot of Japanese cheesecakes to compare. Reading through the comments (with so many helpful tips, thank you! ), I think I saw something about leaving the oven door open part way at the end? I got the suggestion to bake the cake for 10 minutes less than the recommended time, check to make sure it's cooked through, then turn the oven OFF, open the door a few inches, then take it out of the oven after another 10 minutes. I've also heard that beating the egg whites is key. When I used a mixer mine came out terrible!, so I highly recommend whisking by hand. For those who want to have it in US cups and tsp please go and buy a scale, they do not cost a lot of money and you will get better results. I am thinking if your cake is dense then you are not whipping the egg whites correctly, or mixing the egg whipped egg whites with the flour/cheese mix too much. This type of cake only uses the egg white to leven the cake, if you do not have enough air whipping into them or if you fold all the air out tof them they can not do their job. Thank you SO MUCH for the conversion of ingredient amounts. So many recipes for this cheesecake did not include that and I was going to look the conversions up. You took care of that for me. :) Thanks! Excellent! A cross between a chiffon cake and a cheesecake. I converted measurements into tbsp and/or cups and used all purpose flour as I don't like the metallic/acidic aftertaste of cake flour. Trust me, it was delicious and light. 8 oz cream cheese (no need for 9 oz). 4 tbsp butter (half a stick). 6 tbsp full milk. 1/4 cup all purpose flour. 2 tbsp cornstarch. 1 1/2 tsp vanilla extract. 1 or 2 tsp lemon juice (cut from 1 tbsp which is 3 tsp) plus zest of one Lemon or lime. 6 eggs. 1/4 tsp cream of tartar. 2/3 cup minus 1 tbsp sugar. Also I prefer using a 9 inch not 8 inch Springform pan. I have made this many times and it is the best of the best! Wonderful. Yummy. Awesome! Finished on the day on my birthday. Still dreaming about the cake in my dream. Will make it again this week. Thanks for the receipt. You rock my birthday. This is the second time I have made this. I have a problem, after I remove the cake from the oven, it always flattens. So my cake is not beautiful, please advise. Thanks. Well, I followed the recipe to a "T" but my cake turned out like a hard, dried up kitchen sponge and it was very heavy. Is it because I used superfine sugar? I know I didn't beat the egg whites too much, having experienced the results of that before. If anyone has any suggestions, I would appreciate hearing them. I've had Japanese cheesecake in a restaurant and it really was light and fluffy. Hi, I haven't made the recipe yet, I was just wondering if I could substitute or leave out cream of tartar. I would love to follow the recipe to a T but cream of tartar can't be found where I live or anywhere near it really. Also how much protein is the right amount in the flour? In my country flour is called wheat flour, corn flour etc. They're named after what they're made off not what they're used for so I don't know what cake flour is like. I've tried baking it twice and it was really nice but I have cracks on the top every time. I've tried lowering the temperature after 30 minutes but it there's still cracks. And I've also just noticed that there's salt in the ingredient list but it wasn't indicated when we should add it. It came out really good! I will eat it tomorrow with a bunch of friends. I am really happy that I can bake this type of cake here in Ottawa. This used to be one of my favorite cakes when I was in Japan. Perfect recipe! Turned out exactly like the ones they sell in Japan. Cream of tartar is in the recipe simply to stabilize the egg whites and to ensure that you don't over beat them. If you leave it out, your cake should still work out. The salt can either be sifted in with the dry ingredients or added to the egg whites to help them whip together easier. Either way, your cake should turn out fine. If you're getting two textures in your cake, then water from the water bath must be getting into your spring form pan. You can put a pan with boiling water on the rack below the cake, instead of putting the cake in a water bath. The cake simply needs a moist baking environment. Finally, the cake browns quickly. If you've lined your baking pan with parchment and it's high enough, you can simply place a sheet of foil on top to stop the browning. Good luck everyone, and thank you for the recipe. It's a keeper! I haven't made this yet but can someone tell me where I can get "cake flour" from in the UK. I can only think of using supreme sponge self raising? Wow! I just made this for my partner (who is Japanese) on Valentine's Day! Perfect texture and taste! Thank you. My partner loved it and he's pretty fussy! yummy. i have baked this cake for many times, great recipes, thanks. Hi, I was wondering if this can be made with mascarpone cheese instead of cream cheese. I look forward to your response. Thanks. The recipe is wonderful; cottony and cheesy. My family likes it a lot! I will definitely make it again. Thank you for sharing such a gem! I tried it and it turned out really soft and light and yummy. However, my cake did taste too egg-y. Did anyone else have a problem with that? Any suggestions also? Made the cake, but half of the ingredients...and it turns out so good. I was craving for Rikuro Ojian cheesecake which I tried in Osaka, Japan. Your recipe created a perfect replica of the cake. Thank you. Can I ignore the cream of tartar, as I don't know what it is and where I can get it? Thank you for introducing this recipe. Tried making it once and have been making it many more times ever since. 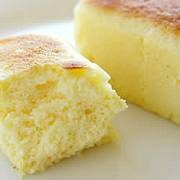 This is the best recipe for Japanese cheesecake so far. Can I use Hong Kong flour instead of cake flour? Do I also need to cover the top of the cake with aluminum foil to avoid top of the cake overburnt? Hi All I see a lot of you have questions. I hope I can share some answers to your questions. 1) Q: Batter Lumpy after adding flour to cheese mixture. A: This is expected. You need to run your mixture after adding flour through wire sieve. This step is a must or your cheesecake will not raise proper and it could cause cheese cake to have a heavy bottom. 2) Q: Must I add flour to cheese mixture. A: Yes it is a must. This is the only way to make sure the flour is mixed thoroughly and does not leave flour lumps. 3) Q: Cheesecake wrinkles A: Temperature of the oven is too high. Please note that this cheesecake is not really a cake, but it is more like a pudding. Therefore it has to be baked on lower temperature and should be baked longer (normally 70 - 80 minutes at 150 Celsius). Tip: I wrap my cake tin with 3 layers of foil and make sure the bottom of the pan is submerge into the water ban marie style. For those who do not do the ban marie submerge style, please take care to turn the temp of oven down and my advise is to wrap the tin with foil as well to prevent wrinkles to form at the side of the cake. Someone once told me, how to know if the temperature is right, is by monitoring how the cake rises. Cheesecake should not raise too much and too fast. If you notice your cake raising very fast, your oven temp is too hot. Turn it down. Another reason why the cheese cake has bumps is often over-beating the egg whites. Medium peaks and hard peaks egg whites when mixed into the cheese batter tend to leave clumps of egg whites in the batter. Sometimes this happens to me as well. My way to fix this is i sieve the final mixture one more time before pouring it into the cake tin. Be gentle when you do this. 4). Q: Cheesecake collapse A: This could be caused by many factors. i) Measurement of ingredients are off. The batter could be too watery. ii) Oven temp too hot, causing cheesecake to raise too fast and collapse when heat is turn off (taking cheesecake out from oven immediately after baking) iii) Opening the oven door during baking and closing it back. Do not do this. Cheese cake are sensitive to temperature changes. Do not touch the oven door till it time is up. After turning off the oven, leave door ajar for at min 30 minutes, till when you put your hands at the gap of the oven door you do not feel intense heat coming out from the oven. After taking out from the oven, immediately remove foil wrap, de-pan, and peel off parchment paper lining at the side of the cake, cool on wire wrack to prevent soggy bottom. If you use a cake pan with a removable bottom, make sure when you de-pan, you remove the metal bottom from the cake as well. 5) Q: Cheesecake flat and turn out like New York cheesecake A: Under whipped egg whites. Egg whites, under whipped, tend to collapse when mixed into the batter. As a result, it will take like New York cheesecake rather then Japanese cheesecake. 6) Q: Cake taste too-eggy A: Use good quality cream cheese. I always Philly cheese. Turns out excellent on all my cheesecakes. 7) Q: Substitute for Cream Tatar A: It can be safely left out. Make sure you are very gentle when you mix the egg whites into the cheese mixture. Cream Tatar acts as egg whites stabilizers. I like to skip it as well, as I do not like the after taste of it in the cake. 8) Q: What is Cake flour. A: Is basically also wheat flour but low in gluten. If you don't have it, make your own. HowÁ Recipe: 1 cup All purpose flour, 2 Tbs Corn flour. Method: Measure AP flour, remove 2 Tbs of AP flour, add in the 2 Tbs of corn flour. Sieve 5x. 9) Q: How to measure dry ingredients using cups A: Scoop, scrape a table knife across the top of the cup to level it. Always use the same cup. Thank you for sharing this recipe. I cooked this cake once and it turned out very nice and delicious, even my Japanese friends liked it. A word of warning: wrap your spring-form pan meticulously to prevent leakage. Even my double layer of aluminum foil proved ineffective, probably because it wasn't wide enough to fully scale the sides of the pan. I suggest heavy duty foil, as it is cut wider than the standard stuff. Even with a slightly soggy bottom, this was fab. Crushed blackberries proved the perfect tangy counterpoint to the cake. This is one awesome post. Thanks Again. I want to bake this cake.. How long should I bake? I would like to try and make this as I am using it as one of two recipes that I am considering using for my birthday this year. However, I am having difficulties because of the measurements. The conversion tool was really helpful, but didn't help convert everything into a usable measurement for me. The one in particular I've struggled with is the "cornflour." Is there an easy way to convert this? Also, is a double boiler required or can I just use a regular pot? Thanks for your help! Hi there, Could I use a 9 inch spring form pan instead...I have no other round pan..for the temp can it be 160 degrees C for the first 20 mins, then lower by 20 degrees, which is 140 degrees, but extend the baking time about 15-20 mins more, about 1 hr 30 mins...I am afraid if temp is 160 degrees all the while, the top may brown too much or even burn because too hot already...if I decrease the temp after 20 mins, do I still need to use a aluminum foil to cover it, to prevent it from browning..I have done a cheesecake recipe similar to yours, but it turns out quite brown or a bit burnt on the top of the cake so I am taking these measures..
Hi, I tried to bake this Japanese Cheesecake this morning using the above recipe. It was a great success despite this is my first time baking cheesecake. The cake rose nicely and the texture was very soft and fluffy. We really enjoy it. I was using a 8" round pan and after baking, I left the oven door ajar for 30 mins. I then let it cool in the pan, on a wire rack for another 2 hrs. Next I removed it from the pan by inverting it on a wire rack and transfer it to a plate. The top layer was a little sticky and some came off. I then refrigerate the cake. Am I doing this cooling process correctly. Thanks. Diana, this cake is super but I add extra content to your recipe and it turned out pretty good too. Thanks to you my daughter who dislikes cheese loves this cheesecake a lot. Can you imagine she ate 5 pieces of the cake. This is what I did. I double your content and lower the temperature to 305 F for 50 minutes and I melt one cup of semisweet chocolate chips with the cream cheese. I use 2% skim milk, and I make chocolate frosting with 100 ml milk, 1/2 cup sugar, 1 cup of semisweet chocolate and 4 TBSP. lemon juice. Very efficiently written information. It will be helpful to anyone who employes it, as well as myself. Keep doing what you are doing - looking forward to more posts. Hi, just wandering can I reduce the amount of the cheese with other remain the same? When you beat egg whites, beat when is dry, 45% to 50% humidity MAXIMUM. If the humidity is too high, your whites don't whip good. Eh. My 5 year old was pleased to make it with minor assistance from me but it was pretty bland but still eggy. Not sweet (which is ok) but no real cheese flavor either. I could have cooked some diced veggies in and it would have been tasty that way too. Not bad and we'll eat the one we've made (turned out fluffy and rose nicely) but I'll find a different recipe next time. The cake turn out to be very nice. But for cheese lover, they found that the cheese is not enough. Can I add another 250g of cream cheese to the same recipeÁ Please advise as i worried it may spoil the cake if i add another 250g to it without increasing other thing. Thanks for sharing. So glad to find this recipe. Will try soon. Hello! I just want to give an enormous thumbs up for the good info you have right here on this post. I will probably be coming again to your weblog for extra soon. Do I need to keep the cake in the fridge? Tastes too buttery, and a little too much like egg. Overall a good starting point though. Will it taste weird to add a cookie crust at the bottom of the cake?